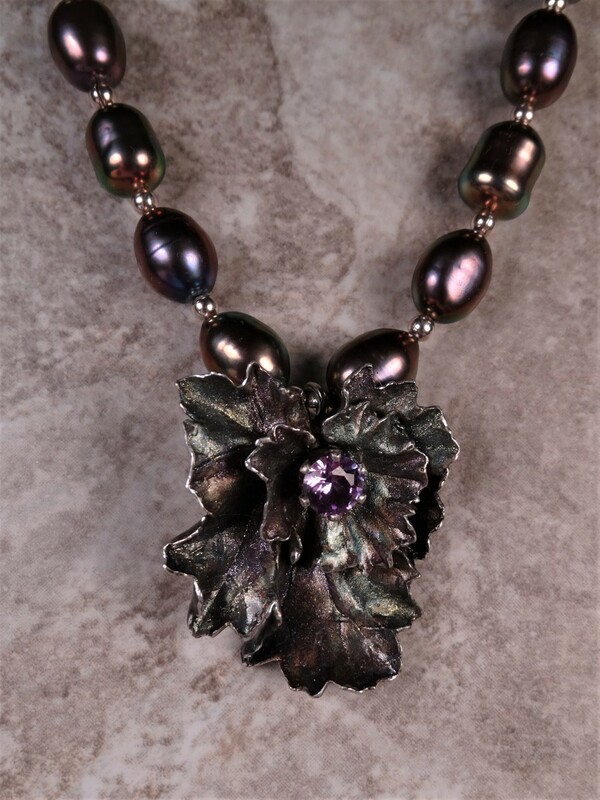 Patinaed silver flower with a prong set Alexandrite center stone, hanging from a stunning strand of plum/gold/green pearls. This two layer flower has been made by painting fine silver paste on a geranium leaf, kiln firing it and adding a plum/teal patinae and burnishing the silver edges. It is set with a 5mm, lab-grown Alexandrite that is sometimes pink, then turning slightly plumish in different light. The pearls have deep, deep lustre and colours of plum, gold and teal green, separated with tiny silver balls. The silver toggle clasp is finished with mini wrapped silver leaves that match the flower. This is my best work this year (so far! ).